Mississippi Mud Cupcakes are full of rich chocolate flavor. They have not one but two frostings piled on them. 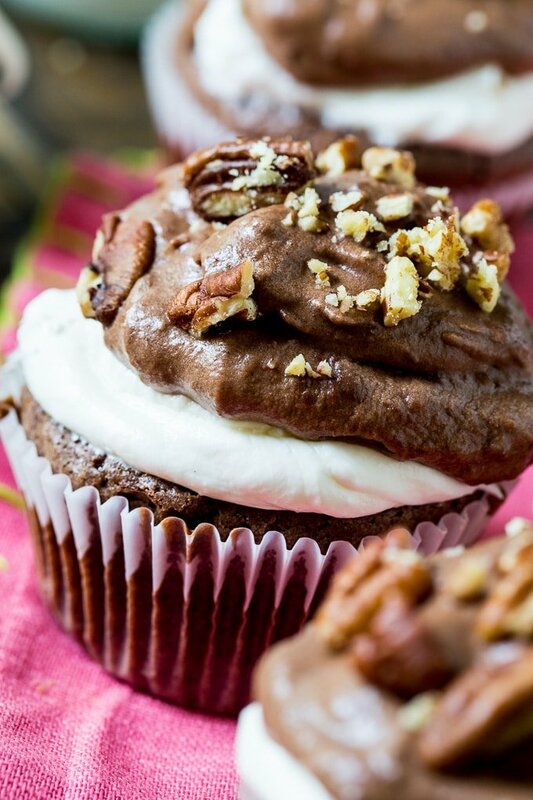 A marshmallow frosting and a chocolate frosting topped with pecans. 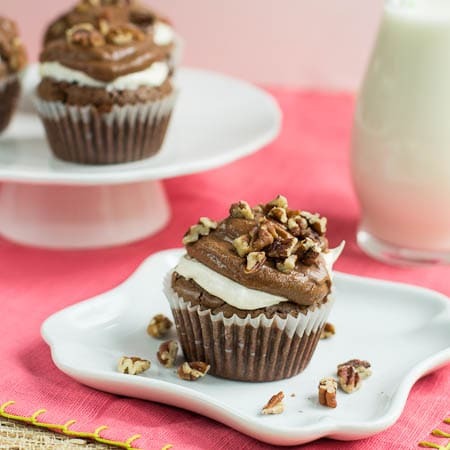 You see Mississippi Mud Cake pretty frequently throughout the South, but rarely Mississippi Mud Cupcakes. And I don’t know why not because everything is cuter in cupcake form. Right? Alright, so maybe making a sheet cake IS a little easier than baking cupcakes. You do have to individually fill the cupcake liners and frost each cupcake, in this case 2 times per cupcake, instead of just pouring the frosting on top of a cake. But the cupcake takes the cake when it comes time to serve. No knife needed, no indecision on whether to cut a little sliver or that great big slab that you REALLY want. You don’t even need a plate. That’s maybe the best thing about a cupcake (says the one who always gets stuck doing the dishes). Just toss that little cupcake liner in the trash when you’re done. Never mind my husband who insists you need a plate anyways to catch the crumbs. He just hasn’t spent as much time as I have doing dishes. 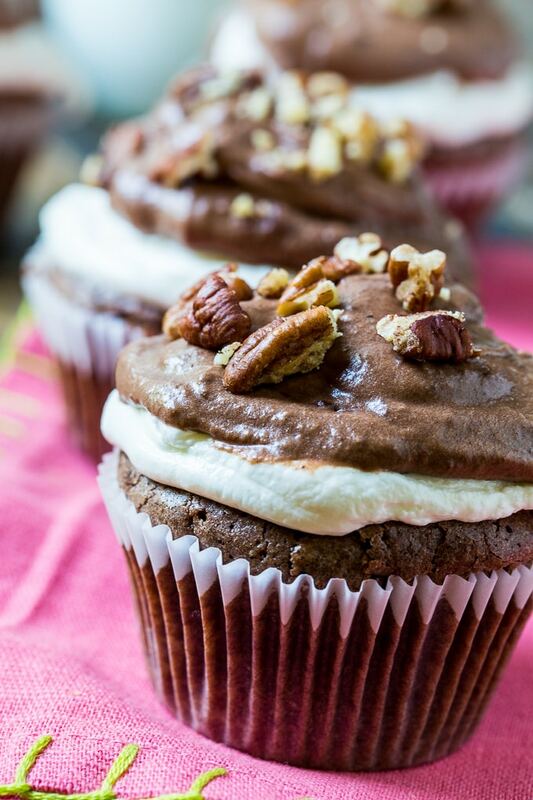 Mississippi Mud Cupcakes are richly decadent with a sweet, chocolaty, brownie-like cupcake, a gooey marshmallow creme layer topped with Chocolate Mud Frosting and toasted pecans. The cupcakes are absolutely loaded with butter and it’s a good thing they are in the form of cupcakes. Hopefully you’ll be able to stop at just one. But if you can’t it will be our little secret. 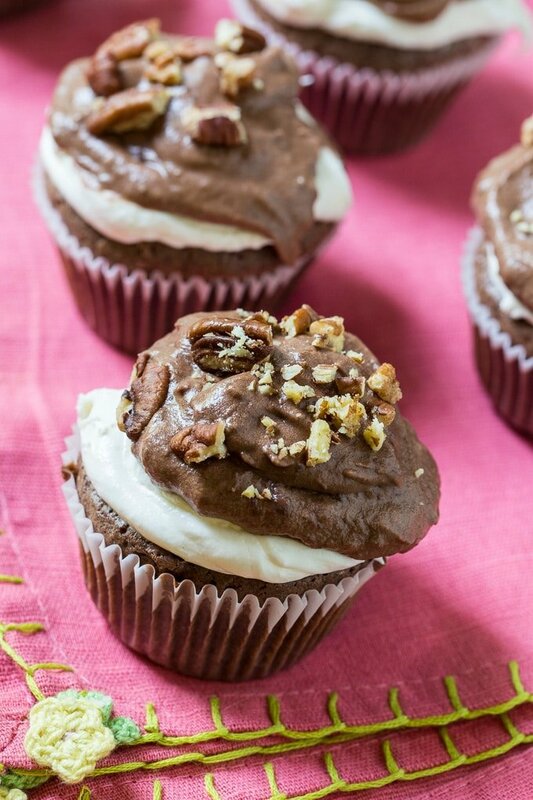 A dense brownie-like cupcake is topped with marshamllow frosting AND choclate mud frosting with pecans. Preheat oven to 350°. Place cupcake liners in a muffin pan and lightly spray with cooking spray. In a heavy-bottomed small saucepan, melt butter and chocolate over very low heat, stirring nonstop to prevent burning of the chocolate. Let cool slightly. In a large bowl, combine sugar and eggs. Whisk together until smooth and light yellow, about 2 minutes. Slowly add chocolate mixture to egg mixture, stirring well. Mix in vanilla extract. Mix in flour mixture just until moistened. Fill muffin cups about 3/4 full and bake for 20 to 25 minutes. Let cool. To make Marshmallow Frosting, beat all ingredients using an electric mixer until smooth. Spread on cupcakes. To make Mud Icing, combine butter and cocoa powder in a mixing bowl and using an electric mixer, beat until smooth. Mix in milk and gradually beat in sugar and vanilla extract. This entry was posted in Cakes, Desserts and tagged chocolate, cupcakes, marshmallow creme, mississippi mud cupcakes, southern recipes. Bookmark the permalink. These cupcakes look so decadent! Love the two layers of frosting! Glory be! That looks scrumptious! Thanks Caddie! You can’t go wrong with chocolate, marshmallows, and pecans. But I’ll take either one! *Squeel* I want to die in a sugar coma from 7 batches of these. YUM!